You don't have to spend money to enjoy Christmas in Vancouver because there are plenty of events, attractions, and activities coming to the city this holiday season that are completely free of charge. ​From ice skating at Robson Square to wandering through creative lighting displays, there are plenty of things you can do on your trip to Vancouver without spending a dime. Located in the heart of downtown Vancouver, the Robson Square Ice Rink is open from December 1, 2018, to the end of February 2019. Although entrance to the rink is free, skate rentals cost extra, so you'll need to bring your own skates if you hope to not spend money at this attraction. Twenty choirs from around Vancouver will join together on Water Street in historic Gastown from 6 to 9 p.m. on Dec. 8, 2018, to sing for charity at the annual Yule Duel event. Each choir will be judged by a panel of celebrity guest judges and the reaction from the crowd to compete for awards and prizes. The event is free to attend, but donations will be collected during the performances, and all funds raised will benefit May's Place, a hospice in the Downtown Eastside. The 13th anniversary of the annual Vancouver Tree Lighting Celebration will take place on November 30, 2018, at the Vancouver Art Gallery in the very heart of downtown Vancouver. The celebration, which lasts from 6 to 7 p.m., includes the ceremonial lighting of an impressive Christmas tree plus live entertainment and refreshments of hot chocolate and cookies. Afterward, your kids can also enjoy a visit with Santa Claus, who will be stationed at a mobile workshop nearby for photo ops. One of Vancouver's most unique holiday traditions is the parade of "Carol Ships"—ships decked out with elaborate Christmas lights—that take to Vancouver's waterways for nightly processions on Friday and Saturday nights in early December. Although it costs money to go aboard one of the Carol Ships in the parade, you can watch this spectacle for free at any of the shoreside Carol Ship events for free. Featured events this year include bonfire watching parties in North Burnaby and West Vancouver's Dundarave Park. Kerrisdale Village--a picturesque shopping district in the southern Vancouver--celebrates the season with lots of free fun on Saturdays, including horse and carriage rides, live Christmas music in the streets, a free skating event, and a chance to meet Santa and his elves. The holiday celebration for 2018 begins on December 8 from noon to 4 p.m. and continues on Saturdays until December 22. The Village will also be open on Sunday, December 16 for the Gliding on Ice free skating event and on Sunday, December 23 for horse and carriage rides. One of the Top five Vancouver holiday attractions, the Santa Claus Parade features more than 60 marching bands, dance troupes, festive floats, and community groups and attracts more than 300,000 spectators along its route through downtown Vancouver each year. The 15th Annual Vancouver Santa Claus Parade returns to the downtown area on Sunday, December 2, 2018, at noon. In previous years, the intersection of Howe and Georgia streets (where the parade makes its only turn) were overcrowded, so event organizers suggest that the best places to watch the festivities are at the start and end of the parade at the intersections of Georgia and Broughton streets and Howe and Davie streets, respectively. Canada Place is a historic landmark on the Vancouver waterfront that's home to the Vancouver Convention Center, the Pan Pacific Vancouver Hotel, and the city's World Trade Centre (among other attractions). 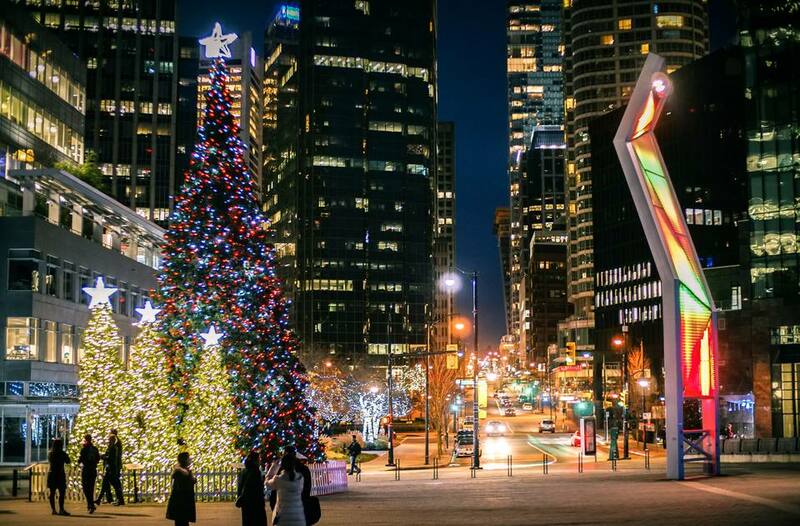 Each year, this popular attraction goes all out for Christmas at Canada Place, a month-long celebration of the holidays featuring lighting displays, family activities, and special events throughout December. This free event will take place at the Canadian Trial and North Point at Canada Place from Friday, December 7, 2018, through Thursday, January 3, 2018. Events and attractions include the famous Canada Place Sails of Light, the Avenue of Christmas Trees, and Woodward’s Windows, a series of window displays that rival New York City's Fifth Avenue holiday windows. Take part in one of the world's oldest traditions at this annual event that celebrates the return of the light after the year's shortest day, the winter solstice, on December 21, 2018. The festival lights up the longest night of the year with lantern displays, live musical performances, and events in Yaletown, Granville Island, and at Dr. Sun Yat-Sen Chinese Garden in Chinatown. All festival events are free, but donations are requested. Held in front of the Vancouver Art Gallery in downtown Vancouver, Light Up the Night celebrates the first night of Hanukkah by lighting Canada's tallest menorah, the Silber Family Agam Menorah. The celebration also includes special performers and free hot cocoa and latkes, and guests will be able to meet local politicians and community leaders throughout the event. This important annual event—which is hosted by the Chabad-Lubavitch of British Columbia—will take place on December 6, 2018, starting at 5 p.m.
Coquitlam's Lafarge Lake transforms into a magical outdoor holiday wonderland each December. With 100,000 twinkling lights, Lights at Lafarge is one of the largest free holiday lights displays in the Lower Mainland. The lights will be turned on in mid-November this year and will stay on nighly until mid-January 2019. You can drive to Lights at Lafarge or take the SkyTrain Evergreen Extension to last stop, Lafarge Lake-Douglas.